BDS Suspension now offers a redesigned 2" leveling kit designed specifically for the new 2017 Ford F250 and F350 Super Duty 4wd trucks. Designed to improve the stance of your truck, these kits allow for 35" tires to be installed. These updated kits are compatible with both gas and diesel equipped trucks and use a bolt in lower coil mount spacers to provide the lift along with ball joint alignment cams, a track bar drop bracket and your choice of new shocks at each corner for improved performance. As with all BDS lift kits, these kits are backed by Factory Protection Plus for peace of mind wherever your adventures may take you. Factory Protection Plus includes BDS’s exclusive No Fine Print Warranty along with a 5-year, 60,000-mile drivetrain warranty. These are the first of many new kits coming available for the new 2017 Ford Super Duty. 2" Leveling Kits: These 2" leveling kits build on the tried and true coil sprung radius arm design of the factory suspension on the 2017 Super Duty that has been carried over from the 2005-2017 trucks. Up front a pair of 2" lower coil spacers bolt into the lower coil mounts. These spacers are built from 6061-aluminum with a durable black e-coat finish and offer a clearer wheel well appearance that top mounted spacers. To correct the front axle positioning a heavy duty replacement track bar drop bracket is supplied to bolt in place of the factory track bar frame mount and recenter the front axle laterally. This bracket is built from 1/4" steel, full welded and finished in a durable textured black powdercoat. A pair of ball joint alignment cams are used to correct the caster with the level kit installed for optimal on-road handling. Capping off these 2" leveling kits are your choice the BDS NX2 series gas shocks or specially tuned FOX 2.0 performance shocks for the front and rear of the new Super Duty. This kit allows for up to 35" tires to be installed. Looking at BDS 2″ level for 2017 F350. shown in photo- is it included as part of the package?? Any issue running a 20×9 0″ offset 35×12.5 wheel with this?? Hey Gregory, sorry for the confusion on that. The 1519H kit for 2017 Super Duty does include the track bar bracket. The website description was pulled from the previous ’05-16 leveling kits (which didn’t use the track bar bracket). The website description will be updated shortly, the description on this new product announcement is accurate. That wheel/tire combo will fit nicely on your Super Duty with the leveling kit installed. 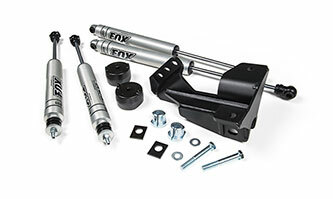 I am also considering this kit for my 17′ 250 with the fox 2.0 and a 33×12.5×20 A/T to keep my highway ride in tact, I was wondering about the use of brake line extension brackets and sway bar drop brackets and if they are needed with this application. I know that you are familiar with this install and could shed some light on this question for me . thank you for your time and have a great day Carter. with the 2″ leveling kit the factory brake lines and sway bar angles don’t require modification. 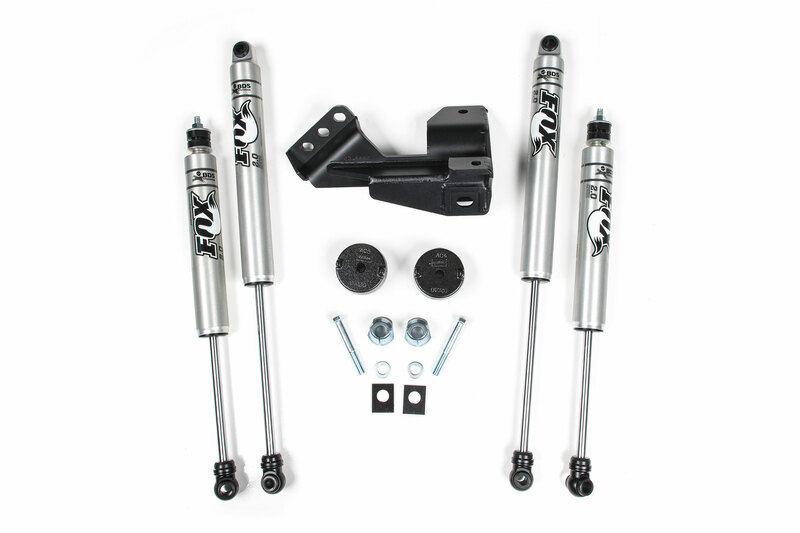 Taller kits do require modification, but at 2″ you’ll be OK to run them as is. On the tire size, the truck run roughly a 33.5″ x 11″ tire stock and the 2″ leveling kits allows for 35×12.50×20 tires to fit comfortably without effecting ride quality. 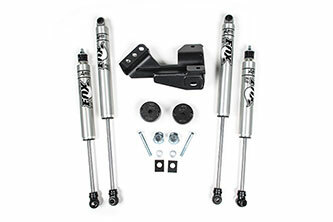 I have my 2017 f250 leveled with your 2″ spacers and shocks I didn’t buy the kit but I would like to purchase your ball joint alignment cams and tract bar drop bracket to keep all part BDS. I’m looking for price and how to get these items. Hey Eric, we have pricing and info is available online, these parts can be purchased through the BDS website or through your local BDS distributor. In the picture of the truck it looks like a 10” wheel on the leveling kit. Would a 20×10 with -25 be a issue with this kit? Hey Clayton, our wheel and tire size recommendations are just that, recommendations. Other sizes can be used, however additional modification (trimming) may be necessary for the tires to clear in all driving situations on road and off.